Lee Andrew May was born on March 23, 1943, in Birmingham, Alabama. His father, Tommy, who played semipro ball around Alabama, made mattresses and springs. His mother, Mildred, plucked and washed chickens in a poultry house. Young Lee held various jobs growing up in Birmingham, including delivering newspapers and office cleaning. Five years later, on May 17, 1948, the Mays welcomed another son into the family, Carlos, who himself had a ten-year career with the Chicago White Sox, New York Yankees, and California Angels. Lee and Carlos’s parents divorced, and Mildred and the two boys moved in with their grandmother. May’s grandmother also helped talk him into signing with the Reds, even after he signed a grant-in-aid at Nebraska. She argued that Cincinnati was close to home and their Double-A affiliate in Macon, Georgia, was not far from Birmingham. Bragan also sold the Reds to May’s grandmother when he said that he could make money right away and could attend college during the offseason. He received a $12,000 bonus from the Reds. The Reds sent May to Tampa in the Class D Florida State League, where his manager was Johnny Vander Meer, of double-no-hitter fame. Vander Meer converted May from an outfielder to a first-baseman. “I threw side-arm too much for an outfielder and my throw would move too much from the target,” May said.5 Initially, he wasn’t on the roster, so he’d practice with the team and watch the game from the stands. “I didn’t feel like part of the club,” May said.6 Finally, he was placed on the roster and responded with a .260 average, no home runs, and nine RBIs in 26 games. Besides gaining invaluable experience playing in the winter leagues, May needed the extra money to help support his family. In January 1962 he had married his high-school sweetheart, Terrye Perdue. Their first child, a daughter, Yelandra, was born that same year. May was a late-season call-up by the Reds, and made his major-league debut at Cincinnati’s Crosley Field on September 1, grounding out as a pinch-hitter. He played in five games, going 0-4 as a pinch-hitter. 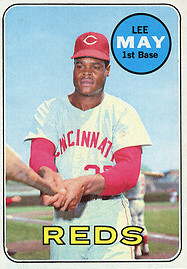 In spring training in 1966 he lost a battle with Tony Perez to be the Reds’ first baseman. On May 11 he was was optioned to Triple-A Buffalo. He hit .316 with 16 home runs, and was called up at the end of the International League season. Inserted into the regular lineup, he had two home runs and 10 RBIs. He got his first major-league hit on September 11, a double off the Phillies’ Chris Short, and his first home run on September 24, off the Mets’ Bob Shaw. As the 1967 season began, May filled in at first base and in the outfield. Lee was initially used as a utility player, covering first base and the outfield. Then first sacker Deron Johnson was benched because of injuries and inconsistent play, and May got the job. In 127 games, he batted .265 with 12 home runs and was named The Sporting News Rookie of the Year. The Big Bopper’s Orioles career started just as Weaver liked it. He hit a home run in his first official at-bat, a three-run shot on Opening Day off Joe Coleman of the Detroit Tigers in the first inning of a 10-0 win for Baltimore at Tiger Stadium. May had a good first season with Baltimore, hitting 20 homers and driving in 99 runs. The team finished in second place in the American League East, 4½ games behind the Boston Red Sox. The Orioles finished in second place again in 1976 and ’77, and fourth in 1978, before winning the pennant in 1979. By then, May was sharing the slugging spotlight with future Hall of Famer Eddie Murray, as they shared time at first base and as the designated hitter. Despite healthy power numbers for each season (27 homers and 99 RBIs in 1977, and 25 homers and 80 RBIs in 1978), May’s playing time began to decline. As age and injuries caught up with him, 1979 was the last season in which he would play in at least 100 games. He had only two pinch-hitting appearances in the World Series as the Orioles fell to the Pirates in seven games. May played in only 78 games for the Orioles in 1980 (.243, seven home runs), and his six-year career with Baltimore ended when he became a free agent after the season. He signed with the Kansas City Royals and played in only 26 games in 1981 as a designated hitter, pinch-hitter, and backup first baseman. On June 8 May got the 2,000 hit of his career, off the New York Yankees’ Dave Righetti. In 1982 he played in 42 games. The Royals released him after the season and he retired as a player, with 2,031 hits. He became the Royals’ hitting coach and was part of Kansas City’s 1985 world championship team. For several seasons, he was on sort of a shuttle between his former teams, coaching first base for the Reds in 1988 and 1989, returning to the Royals for 1992 through 1994, and coaching with the Orioles in 1995 and ’96. Finally, he returned to coach first for one more time in 2002, this time with the Tampa Bay Devil Rays. May was inducted into the Orioles Hall of Fame in 1998 and the Reds Hall of Fame in 2006. In 2009 he was inducted into the Alabama Sports Hall of Fame. Carlos May had a ten-season career with the Chicago White Sox, New York Yankees, and California Angels. He hit only 90 home runs, but he and Lee May are sixth all-time in home runs by two brothers (444). Carlos in 2012 was the minor-league hitting coordinator of the Seattle Mariners. Lee May died on July 29, 2017. The author would like to thank Lee and Terrye May for their time and generosity. Besides sources noted in the endnotes, other sources included the Lee May file from the National Baseball Hall of Fame, baseball-reference.com, and Retrosheet.org. 1 Arnold Hano, “Lee May, the Man Behind the Astros’ Surge,” Sport, August 1972, 70. 2 Jim Murray, “Lee May Does His Job,” Fredericksburg (Virginia) Free Lance-Star, May 30, 1972. 3 The Sporting News, November 18, 1967. 4 Author’s Interview with Lee May, August 17, 2011. 5 Cy Kritzer, “Most Dangerous in the Clutch? Bisons’ Lee May Likely Choice,” The Sporting News, July 14, 1966. 7 Mark Ribowsky, “May Gives Orioles Edge In AL East,” Black Sports, August 1975, 50. 9 Ritter Collett, “There’s ‘Mo’ On The Way: See Exciting Future for Reds’ Lee May,” Baseball Digest, December 1968, 92. 10 Author interview with May. 11 Ribowsky, Black Sports, August 1975, 49. 12 Author’s interview with Lee May, August 17, 2011. 13 Jim Henneman, “May’s HR Speak ‘Oriole Talk,’ ” The Sporting News, August 9, 1975. 14 Author’s interview with Lee May, August 17, 2011.